"Throughout the third quarter we felt quite positive about our ability to meet our expectations. Unfortunately, SAP was not immune from the economic and financial crisis that has enveloped the markets in the second half of September, causing us to report numbers below our expectations." 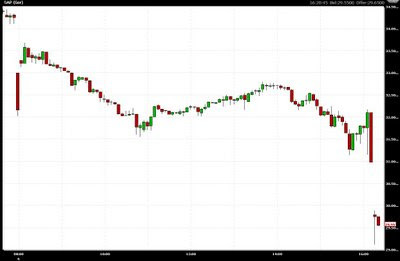 On the day the DAX fell over 6.5% and the Dow broke below 10,000 SAP missed - see the reaction in the chart below just after 16h when the company made the announcement. Some are born unlucky. Some achieve unluckiness. And some have unluckiness thrust upon them. But unlike Twelfth Night, from which these lines are inspired, there is not much of a comedic subplot to entertain SAP or its owners. Or many others for that matter.